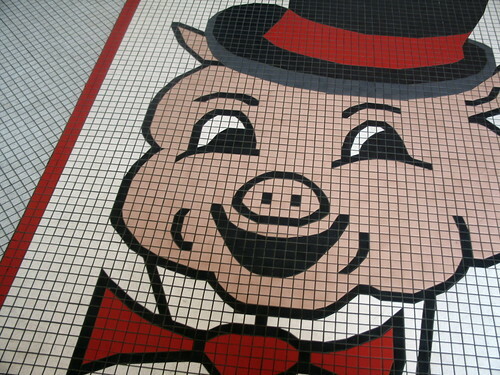 Porky’s Smile, tile floor inside of Porky’s Drive-In, St. Paul, Minnesota, June 2007, photo © 2007 by QuoinMonkey. All rights reserved. Hey, did’ya hear the one about the roof? Ah, never mind…it’s over your head. How about the jump rope?? Nah, skip it. Did you hear the news about the elephant with diarrhea? It’s all over town. Ah, uhem. This week’s topic is humor. As in, side-splitting laughter. LOL. Laugh your head off. Get a sense of humor, for Pete’s sake. Humor me, just this once, and read the quotes below about laughter. What is laughter to you? Is it the flip side of sorrow? Is it the best medicine? Are you a serious person or a goofball? Think about laughter and humor and sadness and joy. Then take your pen and notebook to a quiet place and write these words at the top of your page: I find humor in…. Write for ten minutes. When you’re done, set your timer for another ten minutes and write these words: I don’t find humor in …. Write again. Aba-dee, aba-dee, aba-dee, a… that’s all folks. Laughter is about sharing something at the core of existence. Maybe life is just so ironic that we gotta laugh? I like the list of people quoted. Victor Borge makes me laugh just thinking about his “punctuation” material. When I was a young girl we used to laugh so hard that we sometimes wet out pants. Now I am much older, and often just in jumping to hit an overhead on the tennis court, we wet our pants…and that makes us laugh. I grew up with Scandinavian jokes. Completely reversible, depending on whether its Swedes telling ’em on Norwegians or Norwegians telling ’em on Norwegians. A Norwegian at a flashing red light. LOL. My husband used to play this trick on me whenever we went grocery shopping together (which, before we had kids, we did all the time. Go figure.). We’d be walking down an aisle looking for toothpaste or aspirin or something like that, and as soon as another shopper entered the aisle we were on, Jim would say to me in a loud voice, Honey, don’t forget to grab you a package of Depends. Are Scandanavian jokes always so side-splitting? ybonesy, Ole and Lena would chime in with an emphatic, YES! M, great to read Spanish Summer. I hope people check out your link. Good sensual details. Looking forward to more!